It's the event you've been waiting for! 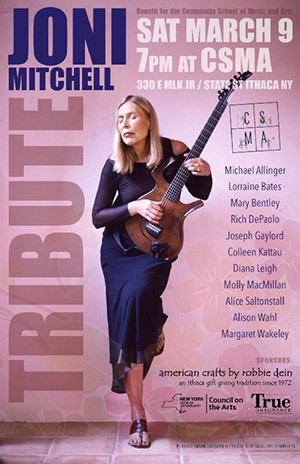 Join us for the 2019 Joni Mitchell Tribute Concert, CSMA's signature event benefiting our arts education programs. The concert will take place on Saturday, March 9 in CSMA's historic Martha Hamblin Hall starting at 7 PM. Doors open at 6:30. Admission is $12 in advance or $15 at the door, with all proceeds benefiting the school. This year’s lineup will include Michael Allinger, Lorraine Bates, Mary Bentley, Rich DePaolo, Joseph Gaylord, Colleen Kattau, Diana Leigh, Molly MacMillan, Alice Saltonstall, Alison Wahl, Margaret Wakeley, and others.